If you are hosting or attending an Event or Celebration at Blakelands, you & your guests can also stay overnight with us. Individually decorated bedrooms differ not only in style but each is individually named, several are named after former owners of Blakelands dating from its 300 year heritage. All have en-suite bathrooms and enjoy panoramic views over picturesque gardens and the Staffordshire countryside beyond. Blakelands also has ample off road car parking and a helicopter landing area. Blakelands Country House bedrooms are set within original buildings and all of the rooms are individually themed and decorated, the inspiration and much of the work coming from Blakelands owners. Blakelands House has three bedrooms available; The Corbett Suite, also doubling as our Bridal Suite, features draped walls and oak floors, and has a lounge area, an adjoining dressing room and splendid “Art Nouveau” bathroom with a separate shower cubicle and large bath. Also in the main House are The Cottage Room , a double bedded room featuring exposed wall timbers from the original 17th Century cottage, and The Oak Room. This room features our second four poster, as well as oak panelling throughout that was fitted when this part of the house was built in the 1700′s. The Stables were converted in 1995 to our guest house. It offers a further three double rooms, one family room and one twin bedded room, “The Painted Room” features oil paintings hanging on walls and an artists feel to the room and furniture. “The Ebony and Ivory Room” is furnished in black and white. “the Paisley Room” again as it suggests follows a Paisley scheme and “The Tweed Room” is a ground floor twin room with walk in shower room and an English country style. 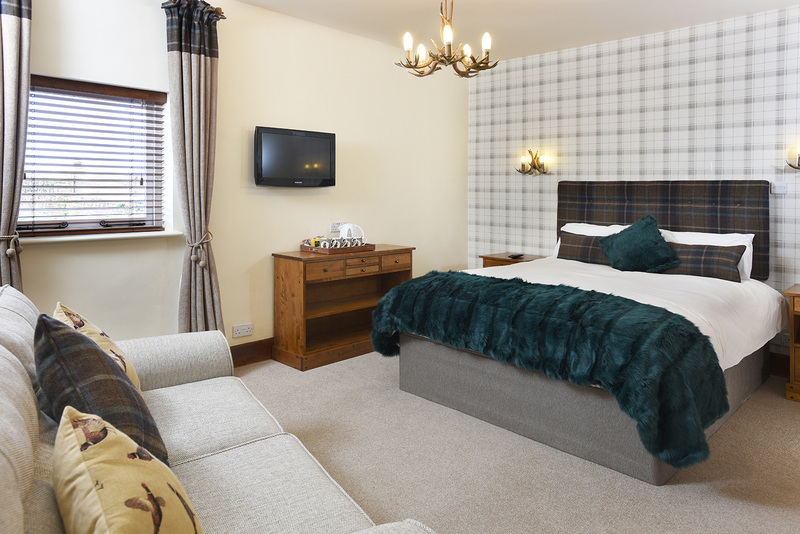 “The Tartan Room” is Family Room, with a king size double bed & double sofa bed for 2 additional guests. Blakelands Lodge offers seven bedrooms. These rooms are all named after former owners of Blakelands. “The Thomas Bowen Suite” featuring en-suite bathroom with an air bath, is named after Thomas Bowen, a malster whose family owned Blakelands from 1802 until 1947. He was also responsible for building the upper story of the Maltings Barn which is now our Banqueting facility. “The Sherington Sparks Room” is named after Sherington Sparks of Bridgnorth who lived here from 1801 to 1802. The “Charles Beckingham Room” a Lawyer from London who inherited the house from the Corbett sisters in the late 1700′s and the “Leonard Harvey Eunson Room”. Dr Leonard Harvey practised in Tipton and Blakelands was his ‘country home’ from 1947 until 1956. The Bolland Room is a ground floor family room that sleeps upto 4, and is named after the ‘Bolland Family’. Two further double rooms, also named after the Bolland family complete the accommodation. The Bolland family still own and farm land in this area today, with one branch of the family, Martin Vickers, owning and running Halfpenny Green Vineyards, a few miles north of Blakelands. The wines are also on sale in the restaurant.